The trouble with email addresses is that a single missing or misplaced character, even a dot, renders them entirely useless. The Employment Appeal Tribunal (EAT) confronted the consequences of one such error in a guideline decision (Galloway v Wood Group UK Limited). In accordance with procedural rules that govern Employment Tribunal (ET) cases, a man who claimed to have been unfairly dismissed notified the Advisory, Conciliation and Arbitration Service (Acas) by completing an early conciliation form. In doing so, he gave a return email address, but this was missing a vital dot. When a potential claimant notifies Acas under the early conciliation scheme, this ‘stops the clock’ for the time limit that applies for presenting the claim to the ET. The time starts running again when the prospective claimant is deemed to have received the early conciliation certificate. Where the claimant has provided an email address, Acas must send the certificate via email and it is deemed to be received on the day it is sent. Acas sent an early conciliation certificate to the email address given but, due to the missing dot, it was not received. By the time the error was picked up, the claim was out of time. An ET subsequently found that Acas had fulfilled its duty by sending the email, albeit to an invalid address, and the man’s claim had therefore been lodged out of time. His challenge to that ruling hinged on the meaning of the phrase ‘an email address’ contained within Paragraph 9(2) of Schedule 1 of the Employment Tribunals (Early Conciliation: Exemptions and Rules of Procedure) Regulations 2014. In upholding the appeal, the EAT found that Parliament must have intended the phrase to refer to an actual email address. An email address that was not registered to a user was merely a meaningless sequence of characters and not an email address at all. 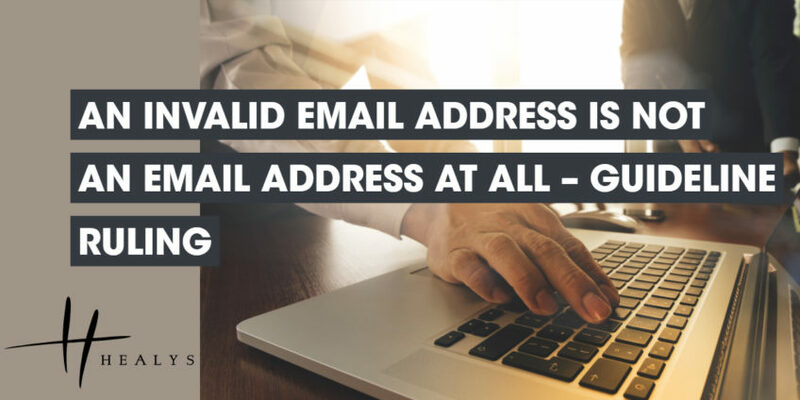 Equally, if an email address could not be recognised by a computer server, it could not be viewed as an email address, no matter how closely it resembled one. The EAT acknowledged that Acas was in no way responsible for the debacle to which the mistranscribed email address gave rise, and that the effect of its ruling was to rescue the man from the consequences of his own error. However, his fault was irrelevant to the task of construing the phrase. The ruling meant that the man’s claim had been issued within the time limit and could proceed to a hearing.